Click on the title or image for more information and to order. 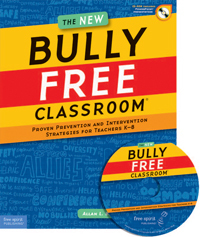 The New Bully Free Classroom makes it easier than ever to create a peaceful, caring classroom that promotes a sense of belonging in all students and stops bullying in its tracks. The update takes a closer look at what bullying is, places renewed emphasis on the role (and power) of bystanders, presents a range of new examples and scenarios, and more thoroughly addresses the issues of cyberbullying—including specific technologies, such as Facebook and texting. Readers will find support for teachers, counselors, and supervisors, including a ready-to-use PowerPoint presentation for preservice and in-service training. The CD-ROM includes all reproducible forms, surveys, handouts, and letters to parents and caregivers found in the book.